The Siegessaule or Victory Column is also found in the Tiergarten district. 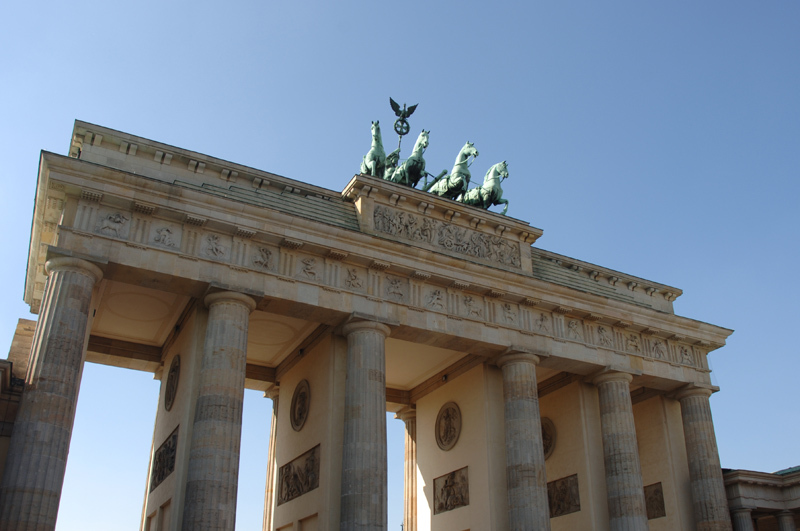 Measuring 68 metres high, it is one of Berlin’s most famous monuments. It was designed by Heinrich Strack in 1873 and built to commemorate the Prussian victory in the war against Denmark. Later, the Prussian army overcame the Austrians in 1866, and after that defeated the French in 1870. This series of victories in what is known as the “Wars of Unification” brought a change to the column: a bronze statue of Victoria, the Goddess of Victory, was added. It measures eight and a half metres high and weighs thirty-five tonnes. Berliners usually call it ´Goldenelse`, which roughly means ´The Golden Elsa`. The column rises up above a base of red granite and an entrance made up of various columns. Each one consists of four solid blocks decorated with the cannons used to achieve victory in the wars mentioned previously. On the Victory Column’s base you will see four relieves made of bronze, which display events from the three wars. These were created by four sculptures from Berlin: Schulz, Keil, Calandrelli and Wolff. The column also acts as a roundabout, cars go past it while visitors can get to it by passing through four tunnels. To climb to the top, ensure you have enough patience and energy because you will have to go up no less than 285 steps through a winding staircase. However, it is really worth making the effort as the views from up here are spectacular. You will be surprised to find out that many Berliners do not know that the Victory Column originally stood right in front of the Reichstag, in what is today the ´Platz der Republik`. The Nazis were the ones who moved it to where it stands today. In contrast to the majority of buildings and monuments mentioned previously, the column hardly suffered any damage during the Second World War. Probably the fact that it was moved had something to do with its survival, because if it had remained in front of the Reichtag it is highly likely to have been destroyed in the bombing of Berlin. An interesting note is that this monument appears in the famous Wim Wenders’ film ´The sky above Berlin`, and is actually where the angels gather. If you have seen the film, you will definitely remember it.